Looking for plans for projects featured on Season 12 of the Woodsmith Shop TV Show? 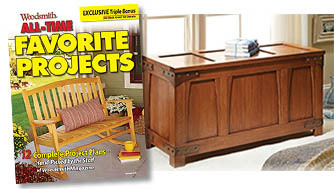 This book consists of 12 complete projects such as a threading jig, gentleman’s dresser, a compact router table & more. 12 complete projects handpicked by the staff of Woodsmith magazine, including a coffee table, frame & easel, and elegant chessboard. Cutting and shaping wood is the cornerstone of successful woodworking. Make these tasks much easier with a few shop-made tools. Ever wonder which projects the cast of the Wordsmith Shop TV show like the most? This book has their favorites and shows you how to make them permanent additions to your home quickly and easily - the Woodsmith way. Take your power tools to the next level of accuracy and capability. Build dedicated tool stations for more organization. Get more versatility with a “shop-in-a-box”. Save space with storage projects — from a large tool cabinet to low-profile, wall-mounted design. Top-notch tips and techniques for your power tools. Secrets for accurate layouts and precision cuts. Also, get the low-down on perfect joinery and assemblies. Ideas, projects, and practical advice for your shop space. Dozens of tips for accurate, proper fitting joinery. Plans for shop-built tools. Also inside, our guide to cleaner cuts with hand tools. Build the perfect bench for your shop: Classic Heirloom, Sturdy & Simple, Crafts & Hobbies or a Roll-Around Cart. Get organized fast with versatile storage projects! Top table saw & router upgrades. Great solutions for cutting, clamping, sanding & more. Make your shop more functional and efficient! How to choose a router, plus router table setup and use. Then, master tips and techniques for the #1 tool in your shop. Get the low-down on basic bits and joinery, must-have accessories, upgrades and add-ons. We've written a book to help inspire you to convert that old disorganized garage and chaotic basement into fresh new spaces. Over 75 space-saving garage and basement storage solutions. Our editors show you how to choose a table saw and set-up. Learn to use your saw for our 5 favorite joints. Get advice on blades, fences, and accessories. Plus, build table saw upgrades and add-ons. 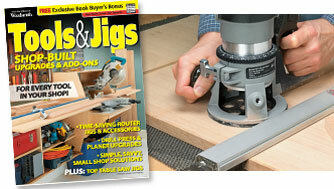 Favorite articles and shop projects to help you get the most out of the number one tool in your shop - your router! Types of routers that are available and what all the features mean to you. Plus, ideas for organizing and storing your routers, bits, and accessories. 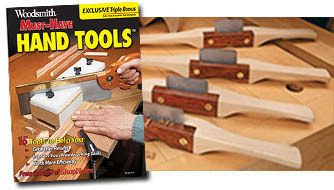 Loaded with table saw tips and router add-ons. Also included: power tool tricks, layout and measuring tips and hands-on techniques. Also get clamping solutions, tips for accurate cuts and storage solutions! Inside are 20 valuable and low-cost shop upgrades like a drill press table, double-duty planer sled and a sturdy workbench. You also get plans for custom layout tools, plus 4 smart workstations. Weekend projects that are beautiful and practical. Home décor, simple storage, kitchen accessories and shop projects. Also included is Shop Notebook: tips and tricks to build projects easily. Bookcase plans for stylish storage. Plus, modular shelving and attractive cabinets made easy. Includes 500-plus photos, illustrations, tips & techniques. Get the most from your table saw with essential tips & techniques developed by the editors of Woodsmith magazine. This Collector's Edition from the editors of Woodsmith includes a wide range of outdoor projects from garden accents to patio tables and chairs. Filled with great projects, tips and techniques to create space and reduce clutter, improve lighting, dust collection—even sound dampening! Tools, tips & techniques for your best shop yet! Shop makeovers, space-saving storage solutions, tool add-ons, and must-have upgrades, plus much more. Step-by-step plans for easy shelves, classic cabinets and beautiful bookcases with custom design options. Projects available in different styles perfect for your home. Great by itself or combined with the new Cabinets, Bookcases & Shelves (above). Must-have guide for anyone wanting to improve a home shop—or start one from scratch! From the editors of ShopNotes magazine. New for 2011. Great by itself or as a companion to Tools & Jigs Vol. 1. Time-and-money-saving upgrades & add-ons for your table saw, router, drill press, band saw and miter saw. New for 2011. Easy-to-build boxes frames and accessories with favorites, including projects from the Woodsmith Shop TV show. Great by itself or as a companion to other Weekend Woodworking books. Inspring projects as chosen by the editors as Woodsmith's best heirlooms. Book includes coupon for $10 discount on plan purchases. First-ever Woodsmith FINISHING book! Start with must-have supplies. Set up your finishing space. Discover how to choose and use stains and a spray system that’s right for you. 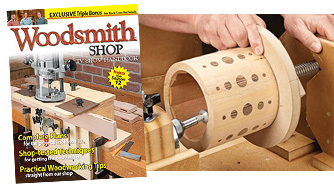 Plus, Woodsmith tips and tricks! Learn from shop pros the tried-and-true woodworking techniques that save you time, money and needless frustration. Table saw set-up, plus cutting precise small parts, long stock, plywood panels and miters. Plans for an adjustable tenoning jig, 4-in-1 box sled, taper jig and more. Easy-to-master woodworking techniques! 100-page book helps you quickly sharpen your skills. Great by itself or as a companion to the other Weekend Woodworking books. From the editors of Woodsmith magazine. Money-saving upgrades for your table saw and router, plus innovative shop-built tools guaranteed to improve your results. Learn favorite techniques from Woodsmith editors using these add-ons. Second in our series of Weekend Woodworking project books. It’s filled with home storage, home office, kitchen accessory and shop projects designed for completion in a single weekend. Great by itself or as a companion to the other Weekend Woodworking books. Shop-built jigs, basic bits and joinery, must-have accessories, plus tips and techniques for the most versatile tool in your shop. 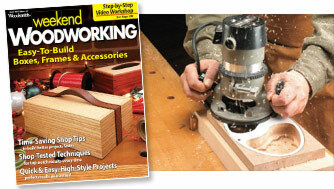 Get the most from your router table with essential tips & techniques developed by the editors of Woodsmith magazine. Simple woodworking jigs and accessories that you can buld in a few hours. Plus, how to build your own shop tools and save $100s. From the editors of ShopNotes magazine. Learn table saw techniques the easy way — and become a better woodworker. Includes bonus CD with videos. From the editors of Woodsmith magazine. Tune your saw for peak performance. Master essential table saw joinery. Learn surprisingly easy advanced techniques. Build must-have accessories for savings and performance you’ll value forever. A compilation of more than 200 tips and techniques we rely on day in and day out. Packed full of ideas that help you store more, get better organized, and add a whole lot of style to your home. Hundreds of ideas that you can use to create your outdoor living space your way, with your style, and on your budget.